Musa Hlatshwayo is the 2018 Standard Bank Young Artist Award Winner for Dance. He has created EBuTHONGWENI, a new full-length innovative site-specific dance theatre piece, for his company Mhayise Productions’ first season for 2018. Choreographed and directed by the multi-award winning Hlatshwayo, this production features an ensemble of multi-skilled performers moving to the sounds of a live band comprising street-smart guitar maestro Thabani Mahlobo, the famous pipe-and-shaker busker Unico Muzico and the dynamic urban-Zulu wordsmith, guitarist, songstress and powerhouse Phumzile Zondo. This piece is sure to thrill, challenge and excite audiences to journey into a realm where dreams, visions and epiphanies constantly unfold. Carefully placed and creatively threaded in and around the Pump House at the Durban South Beach, this dynamic performance is sure to leave audiences moved. 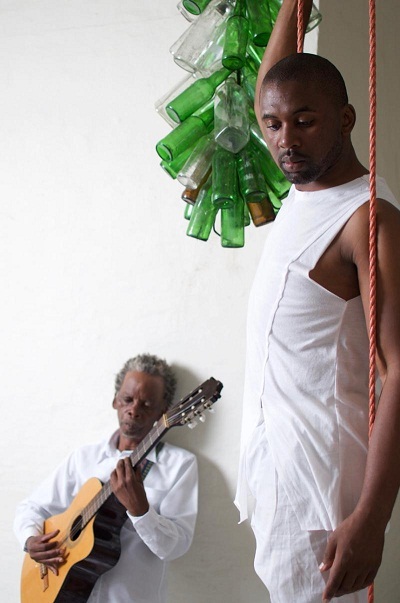 EBuTHONGWENI is a dynamic integration of contemporary dance with personal stories retold in abstract and narrative format. Creative text, music and poetic imagery all seamlessly combine to be beautifully echoed by the refreshing soundscape and ambience of the Durban South Beach. With a unique set made out of a thousand recycled bottles, thousands of used paper and other materials, this magical piece lands itself as an activation, installation and a performance that is bound to be a truly unique trance-inducing experience. “Messages and messengers will be sent dressed in white and coded in metallic-coloured dreams. Questions will arise...discoveries might unfold as we journey on; ‘EBuTHONGWENI,” says Hlatshwayo. “EBuTHONGWENI” can be loosely translated as ‘in sleep’. In the African context, however, many continue to discover more articulate meanings behind the state of ‘sleep’ where some have defined it as a state of ‘rest’ where the physical body slides into a biologically wired “coma” while the spirit recharges ...or continues experiencing life in the subconscious and spiritual sphere. “EBuTHONGWENI” can also be defined as a subconscious transitioning of the soul into a hypnotic trance where the physical body surrenders to a spiritual maintenance; an experience of connections and disconnections guided by various factors, the source(s) and the agents of our mysterious living. The production will take place at The Pump House on the Durban beachfront. The space is an unconventional performance space and the performance is site specific. The show will include moving around and will have sections that will get the audience members possibly moving closer to the beach. Warm and comfortable clothing is advised. Invited guests will be performing alongside the Mhayise Productions cast and its Movement Laboratory trainees will be joining them for their professional work experience. This is a family show, children will be allowed provided they are supervised and accompanied by an adult. Mhayise Productions acknowledges the support of the NAC for the grant that has made this possible; EThekwini Municipality for the use of the Pump House; EThekwini Living Arts Culture and heritage for the rehearsal space; Smanga Zondo for the photographs, and Standard Bank and the National Arts Festival for the support. EBuTHONGWENI runs from January 24 to 27 at 19h00 with a further performance on January 28 at 15h00 at The Pump House near California Dreaming on the Durban beachfront near the swimming pools. Although tickets will be sold at the door, it is advisable for audience members to pre book via email or phone call as space will be limited. Bookings and enquiries: mhayiseproductions@yahoo.com or 081 305 5212. Tickets R65 (R55 pensioners and students) purchased at the door.